A defining American story, never before told with such breadth of scope, lavish research, and resounding spirit. With more than three million foreign-born residents today, New York has been America's defining port of entry for nearly four centuries, a magnet for transplants from all over the globe. These migrants have brought their hundreds of languages and distinct cultures to the city, and from there to the entire country. More immigrants have come to New York than all other entry points combined. City of Dreams is peopled with memorable characters both beloved and unfamiliar, whose lives unfold in rich detail: the young man from the Caribbean who passed through New York on his way to becoming a Founding Father; the ten-year-old Angelo Siciliano, from Calabria, who transformed into Charles Atlas, bodybuilder; Dominican-born Oscar de la Renta, whose couture designs have dressed first ladies from Jackie Kennedy to Michelle Obama. Tyler Anbinder's story is one of innovators and artists, revolutionaries and rioters, staggering deprivation and soaring triumphs, all playing out against the powerful backdrop of New York City, at once ever-changing and profoundly, permanently itself. As midnight drew near on New Year's Eve 1891, New Yorkers thronged lower Broadway. Its watering holes had been packed for hours, with revelers throwing back shots of whiskey, hot toddies, and eggnog as they prepared to brave the cold for the traditional outdoor countdown. It seemed as if every city resident, young and old, man and woman, native and newcomer, was out in the streets blowing a "fish horn," the favorite New Year's noisemaker of the era. In the final minutes before midnight, thousands surged out of the bars, brownstones, and tenements of lower Manhattan toward two traditional spots where New Yorkers had been celebrating this occasion for generations. It would take a ridiculous number of pages to chronicle all the fascinating revelations embedded within Anbinder's brick of a book, a sprawling chronicle which lives up to its subtitle: The 400-Year Epic History of Immigrant New York. For all its comprehensiveness, it remains a compelling – and at times touchingly personal – page-turner. (Reviewed by James Broderick). Starred Review. Anbinder's stunning image of New York as a true city of immigrants ... captures the imagination. Starred Review. Essential for civic-minded readers, history buffs, fans of New York, and public and academic libraries. Starred Review. An endlessly fascinating kaleidoscope of American history. A fantastic historical resource. Immigrants to New York City have always faced impediments in their efforts to assimilate. A new landscape, a new culture, and even a new language invariably pose challenges to the most determined recent arrivals. Often, the jobs available are at the lowest rung of the economic ladder, and especially in the days of unregulated workplaces, required long hours under hazardous conditions. 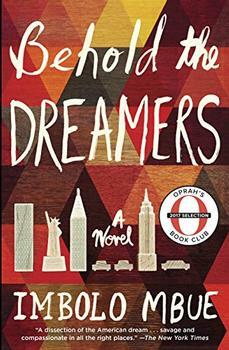 In the vein of Amy Tan and Khaled Hosseini comes a compulsively readable debut novel about marriage, immigration, class, race, and the trapdoors in the American Dream - the unforgettable story of a young Cameroonian couple making a new life in New York just as the Great Recession upends the economy.